Youth will be part of the future local development and assume important roles in the resolution of conflicts within their communities. Thus building their capacity as peacebuilding actors is key to strengthen democratic governance and solve problems at the local and national levels. My interest in peacebuilding and sustainable development started about a decade ago and led to a bachelor´s degree in International Relations and a master´s degree in Global Studies, together with some work experience with The Swedish Migration Agency and Sweden´s Ministry of Foreign Affairs. Working to improve the lives of those in need, together with an interest to support and improve governmental structures to increase democratic governance were the main reasons I decided to apply for this position as a UN Volunteer. Although conflict as such is a normal condition in human relations, it is important to address conflict effectively to prevent the occurrence of violence. With this in mind, our team works with governmental and ancestral authorities, as well as civil society and other actors on issues related to conflict management and dialogue aiming to transform social conflicts and build peace. A specific project I was involved in during my first year as a UN volunteer aimed to enable key actors to facilitate dialogue, mediation and consensus-building initiatives for conflict prevention and management, while giving indigenous authorities, youth and women a central role as peacebuilding actors. The initiative was jointly promoted by the United Nations Department of Political Affairs (DPA), UNDP and the European Union. 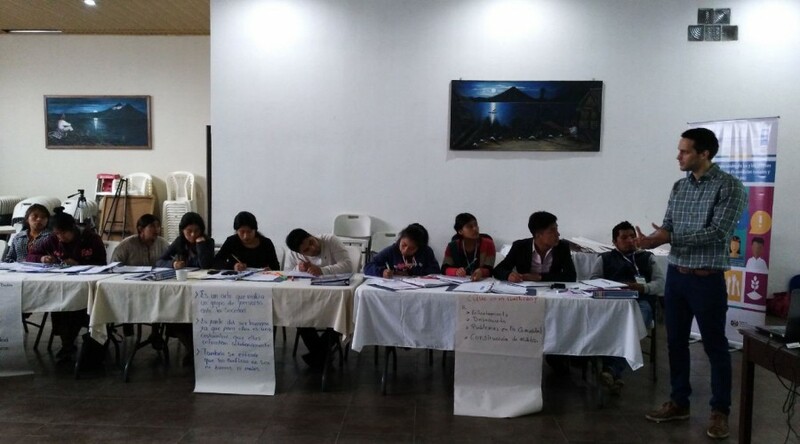 Within the project, we trained around 35 young leaders from the Ixil region in conflict resolution and transformation, with a special focus on conflict analysis, mediation, negotiation and dialogue to promote peace and social harmony in their communities. I was responsible for organizing and planning the workshops, occasionally acting also as an instructor and providing support as needed. The trainings aimed to strengthen youth's capacities to constructively address social conflicts and promote peacebuilding. Additionally, it allowed to practice dialogue and consensus-building, and to lobby for initiatives that lead to sustainable, inclusive and equitable development. A specific part of the session included group work to identify a local problem affecting youth and to put together an action plan to manage and solve the problem together with decision-makers. Given that youth will be part of the future local development and assume important roles in the resolution of conflicts within their communities, building their capacity as peacebuilding actors is key to strengthen democratic governance and solve problems at the local and national levels.